The final four in the New Japan Cup on Saturday has Kazuchika Okada vs. Tomohiro Ishii and Hiroshi Tanahashi vs. Seiya Sanada. Because of the time difference, both the semifinals and finals will take place the same day on the West Coast in an early morning and late night show, plus there is UFC and the NCAA wrestling tournament all on that night. Allie is no longer working for Impact. She had finished up at the last set of tapings and then negotiated with AEW. Her contract had expired with Impact and wasn't being renewed. 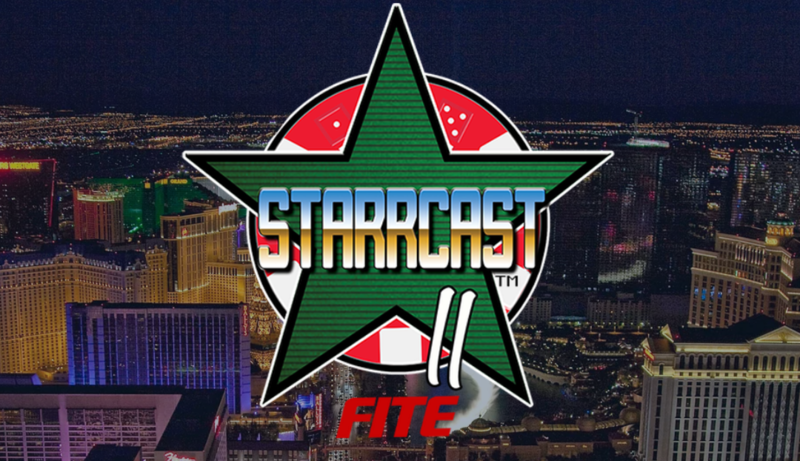 Starrcast has announced on its Twitter a full series of events at Caesar's Palace in Las Vegas on 5/23 to 5/26. There will be the premiere of a documentary on Joey Ryan at 6:30 p.m. on 5/23. There will be an evening with Cody & Young Bucks at 8:30 p.m. On 5/24, there is a Jim Ross/Jerry Lawler show at 10 a.m., a Sting show at 10 a.m., an Eric Bischoff show at 12:30 p.m., a press conference and weigh-ins at 4 p.m., Wrestling Observer Radio at 5 p.m. and a Colt Cabana show at 7 p.m. Saturday at Noon will be a Tully Blanchard/Magnum T.A. show. Sunday at 10 a.m. will be a show about Brian Pillman as well as a Chris Jericho show, a Lita show at 12:30 p.m., Bruce Prichard at Noon, Rob Van Dam & Jerry Lynn at 2 p.m. and there are many other things yet to be announced. Caristico and Soberano Jr. will be working the ROH shows on 4/13 in Pittsburgh and 4/14 in Columbus, OH. Flip Gordon will be returning on the 3/31 show in Baltimore. Paul Levesque and Stephanie McMahon have donated $1 million to the University of Pittsburgh Medical Center's Children's Hospital to help establish a family centered therapy suite. The New Day, Rusev and Lana were all on TNT's Drop the Mic last night. WWE has a promotion with the Boston Red Sox at Fenway Park in Boston on 9/3 for a Red Sox game with the Minnesota Twins. All ticket holders will get a special Red Sox WWE themed item. Newsday has a story on Tony Nese. The Becky Lynch Funko Pop was the No. 1 best seller today in the Toys & Games category on Amazon. A story on Alexa Bliss and WrestleMania. A story on WWE scouting talent at Penn State. Lots of people have brought up yesterday's All Japan show headlined by Naoya Nomura vs. Kento Miyahara as one of the best shows so far this year. Impact has sold out both its Friday and Saturday night TV tapings in Windsor, ONT at the St. Clair College Gym. Regarding Puma King being off the MLW shows, there was clearly a misunderstanding since MLW said it was because he double-booked himself but he already had the prior bookings for Mania week before MLW ever offered those dates, and things had been worked out between MLW and High Spots regarding him working both shows. However, he was told today that MLW had taken him off those shows citing his asking price. AXS tomorrow night has Tetsuya Naito vs. Kota Ibushi and Evil vs. Zack Sabre Jr. from the New Japan Cup at 8 p.m.
KSW runs Saturday from Lodz, Poland with heavyweight champion Phil DeFries (16-6) vs. light heavyweight champion Tomasz Narkun (16-2), plus the big one has former multi-time world's strongest man winner Mariusz Pudzianowski (12-6) facing Olympic weightlifting gold medalist Szymon Kolecki (6-1). Olympic medalists Satoshi Ishii (judo) and Damian Janikowski (wrestling) are also on the show. This show starts at 2 p.m. Eastern and airs live on DAZN. Aaron Solow will be defending his Dojo Pro title against Liam Fury on the Fale Dojo show on 3/30 in Auckland, New Zealand. Lego actually sent a cease and desist order to Inter Species Wrestling for promoting an event for a match where Legos would be used as weapons. CWE on 3/29 in Dauphin, Manitoba at the Watson Art Centre with Psicosis vs. Michael Allen Richard Clark. They also run 3/31 in Yorkton, Saskatchewan at the Yorkdale Central School and 4/2 in Prince Albert, SK at Parkland Hall. The WSU promotion has changed its name from Women's Superstars Uncensored to Women's Superstars United. Neo Fight Pro is looking at sending Tae Honma and maybe one or two other women wrestlers to the U.S. in July. The company will pay for transportation, the local promoter will pay for the nightly fight fee and they are looking for DVD rights to the footage for the Japanese market for matches with their women that they could sell with Japanese subtitles. For promoters interested you can write to MagicaDo@live.jp. Defy Wrestling on 4/13 in Portland, OR at the Hawthorne Theater features Jimmy Havoc. First Wrestling has an iPPV tonight on FITE TV from Minneapolis at the James Bellentine Uptown VFW at 9 p.m. The show is sold out. Kyle Rae of AEW faces Priscilla Kelly, Mercedes Martinez vs. Jordynne Grace plus Penelope Ford, Jessicka Havok, Shotzi Blackheart, Solo Darling, Kimber Lee and others are wrestling on the show. There is a new comic book called Luchaverse: Konnan & The Ambassadrs up. LFA announced they would have four cards in May airing at 9 p.m. every Friday night on AXS TV. The shows are 5/3 from Vail, CO at the Dobson Arena, the first nationally televised MMA event from the ski resort; 5/10 in Salt Lake City at the Maverik Center; 5/24 in Branson, MO at the Convention Center and 5/31 in Prior Lake, MN at the Mystic Lake Casino Hotel. AXS Fights with the LFA returns to a 9 p.m. start time after New Japan with a show tomorrow night from Dallas at the Bomb Factory with Vince Cachero (6-0) vs. Casey Kenney (10-1-1) for the interim bantamweight title. Kimura announced she was leaving W-1 at the end of the month. The ROH/NJPW Festival of Honor on 4/5 at the Hulu Theater in Madison Square Garden starts at 10 a.m. with a Meet and Greet with The Kingdom, 12:30-1:45 with a Meet and Greet with PCO & Body King, 2-3:30 with Jay Lethal. Rey Hours vs. Ace Austin has been added t the 4/4 MLW show in Queens, NY. Bruiser Brody round table with J.J. Diillon, Barbara Goodish and Stan Hansen. A recorded video aired during Michael Nakazawa's farewell show today where KennyOmega addressed the DDT fans. He said that Nakazawa is free to continue working DDT dates and hinted that he would also show up in the future as well. The full video was shared on Sanshiro Takagi's Twitter.